We had a super short week of school lunches this week because of the Thanksgiving holiday, so I’m posting the weekly wrap-up a little early. On Monday Wyatt took lunch in the Lego Box . 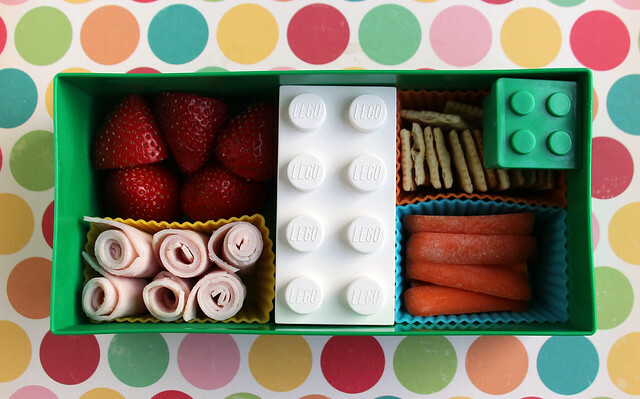 He had strawberries, turkey spirals, a dill pickle (inside the medium, white Lego box ), mini Saltines, carrots and black bean dip (in the small, green Lego box). I used some new rectangular silicone cups I got over the weekend in this lunch. I mentioned these on Facebook and a few people asked about how they were working, so I thought I’d point them out. They are a little too short to fit all the way across the box (like the white Lego box does), but if I put two of them side by side they fit perfectly. They’re a little shorter than I would prefer — shorter than the silicone cups I normally use — but they worked OK in this box when I put a folded napkin on top of them to keep things from moving around. Augie had exactly the same things packed into a single layer of our monbento box. I packed his dill pickles in a little suitcase cup and I was pleased to see that the rectangle cups also fit side by side in this box. 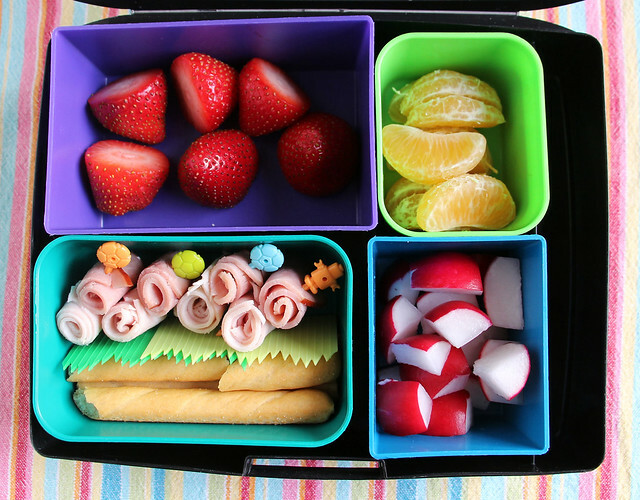 Yesterday, Wyatt requested his Laptop Lunches bento box. He had strawberries, clementine wedges, radishes, ham and turkey spirals on soccer ball picks and a couple of breadsticks that I broke in half. I also tucked a couple pieces of silicone sushi grass between the meat and the breadsticks to keep the sticks from getting soggy. 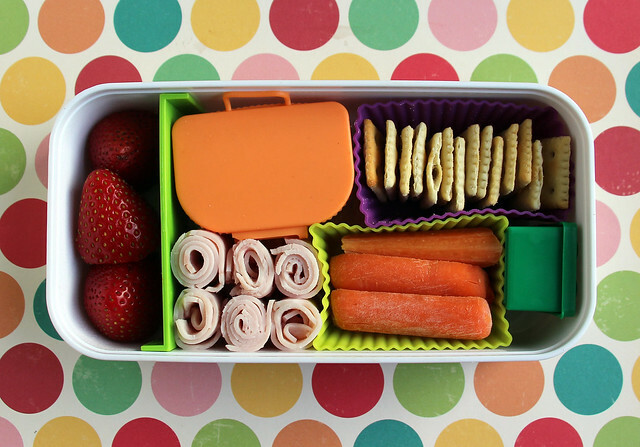 Note: if you’ve been thinking about buying a Laptop Lunches box (or accessories), now is a good time to do it. Laptop Lunches is having a rare site-wide sale and is offering free shipping with a coupon code (gift2013). The discount is pretty small, but since Laptop Lunches has sales so infrequently it’s a great opportunity to get a box for a little less than you’d normally pay. 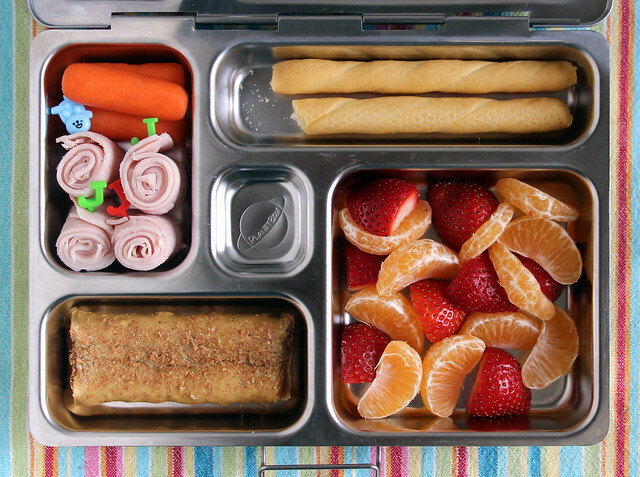 Augie’s lunch was packed in the PlanetBox : carrots, turkey spirals speared with “J” picks, breadsticks, strawberries and clementines and a strawberry cereal bar. That’s all folks! I’m off to make stuffing and express gratitude for all of the wonderful things in my life. One of those things is YOU! I appreciate every person who comes to visit Wendolonia, who chimes in to the conversations on Facebook and Twitter, or who jokes with me on Instagram. My life is better with you in it! Thank you!